Renowned through generations as an exceptional fishing/family resort. 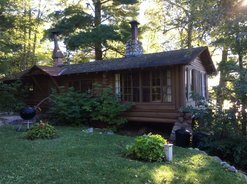 Cabin accommodations in natural, unspoiled surroundings w/fireplaces, screened porches & rec. area for children. Sandy beach, bait, tackle, groc., gas, guide service, etc. 15% off spring/fall.